In this second instalment of Crobs’ exploration of chess variants, we thought we’d cover one that players could easily attempt and integrate into their social chess play if they enjoyed it. 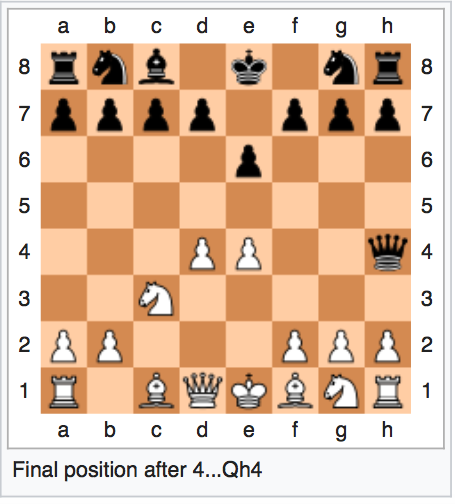 Using the standard chessboard, the standard pieces and the standard rules, this variant involves only one point of difference – the winner is the first person to check their opponent three times, hence its name ‘Three-Check Chess’. White resigns, unable toprevent a third check by Qxf2+ or Qxe4+. The winning move has to be legal, e.g. you cannot give the third check while in check. Checkmating your opponent is still a legal way to win. A move is considered to give one check if the King is threatened even if multiple pieces are simultaneously delivering check. Three-Check Chess is a game where sacrifices are plentiful, endgames are rare and draws almost never occur. It’s also one that many International, FIDE and Grand Masters have endorsed as a fun chess derivative but if that still doesn’t help you convince others to give it a go with you, fortunately its popularity means you can go online to find an opponent or to play against a computer. Failing that, here’s a video of GM Fabiano Caruana, one of the current ‘wonder boys’ of the chess world, attempting Three-Check Chess to amuse you. On a side note, since we’re on the topic, not only did Italian-American Caruana become a grandmaster at only 14 years of age – the youngest GM in the history of both Italy and the US at the time – he will be challenging reigning champ, Magnus Carlsen, for the World Championship in November and if successful, will be the first American to hold the world title since Fischer. Exciting times for the global chess community! Crobs' Coffee & Chess is a project founded by Chris Roberton to reduce feelings of social isolation by people with disability and to encourage participation in the community.